Send custom made HTML email templates using the ConstantContact email marketing platform. Make sure you select “Restricted Compatibility” before clicking “Export.” This is needed to make your design compatible in ConstantContact. Choose “Custom code” and give your campaign a name. In the next window, select HTML as the format of your email. Enter the subject line and recipients and then move on to the “Advanced editor.” Then, delete the default code in the HTML editor. After you have copied the HTML code into your ConstantContact email template, you can select preview to check for any mistakes. You can now use your Mail Designer 365 HTML design with the automation tools provided in the ConstantContact platform. 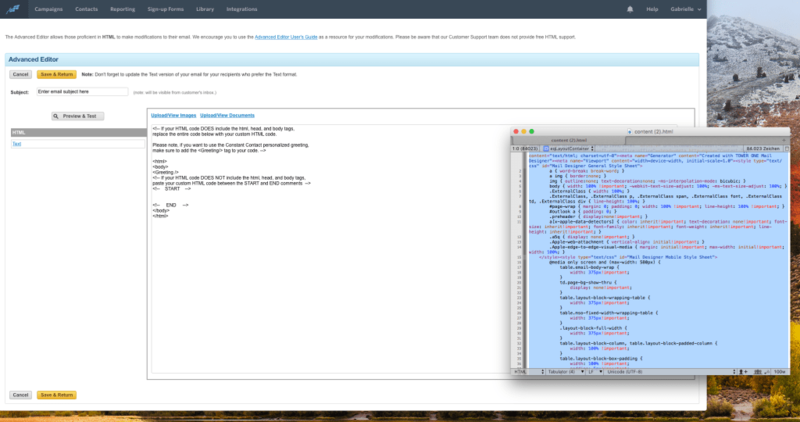 Use your HTML email design with the ConstantContact platform. Our team is always on hand ready to give you support. If you have specific questions regarding HTML export to ConstantContact, or just need some extra help getting set up, get in touch! Mail Designer 365 helps you create stylish, professional HTML emails on your Mac to use with ConstantContact. Download for free to see what you can achieve.